A man has been given a life sentence for murdering a young mother he met on an online dating site last year. 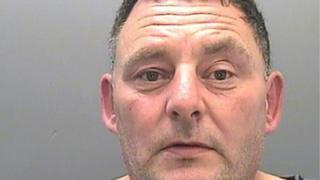 Anthony Lowe, 46, of Riverside, Cardiff, killed 26-year-old Katherine Smith in Ely, in a "ferocious" attack. Ms Smith was stabbed 33 times last September, receiving wounds to her back, heart and lungs, two months after they met on the website Plenty of Fish. Lowe pleaded guilty to murder at Cardiff Crown Court on Tuesday and was jailed for a minimum of 18 years. Lowe faked his identity to meet Ms Smith, saying he was 10 years younger and his name was Tony Moore. After killing Ms Smith, he took her car and began approaching other women online. Prosecutor Michael Jones QC said: "Despite having murdered Miss Smith, he was using Facebook to contact other people. "He messaged one lady saying 'You look stunning'. "Chillingly, as she asked 'I thought you were in a relationship?' he said 'No, I am single now'." Image caption Katherine Smith's family said she was a "loving daughter, granddaughter, sister and friend"
Mr Jones said that on the night of her death Ms Smith drove to Tongwynlais Rugby Club with Lowe and two friends. On their return the couple argued, continuing as they arrived at her flat around 22:20 BST on 27 September. He said: "Nineteen minutes later the vehicle is seen leaving the location of Miss Smith's flat. "It was driven by Lowe, leaving in her car having just murdered her." Lowe texted Ms Smith's mother saying: "You need to send the police to the flat because Katherine is lying on the living room floor dead. "I am not talking crap, my name is not Tony Moore and I am not 37. "I am sorry but that won't make up for me killing your daughter." Police went to Miss Smith's flat the following morning and found her in a pool of blood, with the blade nearby. Lowe was arrested outside a Tesco store in Weston-super-Mare at 20:00 later that day. Ms Smith's mother said in an impact statement: "Katherine was beautiful, intelligent and caring. "Our hearts are broken and nothing in this life will ever mend that. "Anthony Lowe, you have not just taken one life, you have taken my life, as I do not live now, I just exist.